Mango season in Hawaii is a deluge. Growing up, everyone had a backyard mango tree, and all mangoes seem to ripen at the same time. Hayden, Shibata, Pyrie, doesn't matter. At that point, you can't even give them away. I'm quite sure this recipe was started out of pure desperation. It starts out "10-15 green, hard, unripe mangoes..." And like shave(no-"d") ice, "pickle mango" also seems to have lost its grammar along the way. While pickle mango is a similar idea to the Thai green papaya/green mango salad, the Hawaii version is definitely a "small-kid time" snack that will always remind me of summer mango season. 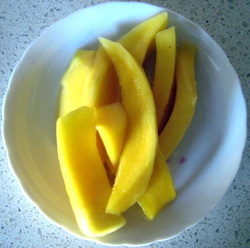 Peel and cut mango into pickle-like slices. Put into a heat-proof canning jar. Heat sugar, vinegar and salt until everything is dissolved, but do not bring to a boil. Pour hot liquid over mango slices and mix well. Add li-hing mui to the mix and stir or shake to coat. Refrigerate.